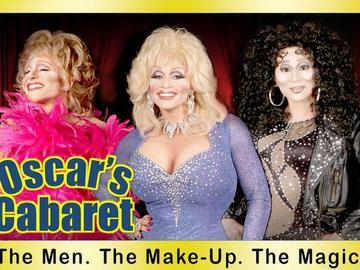 Palm Springs hit dinner show, Oscar's Cabaret has been featured in casinos, supper clubs and private events throughout the country. Most noted for its decade long run at Lake Tahoe's Horizon Casino and legendary Mastress of Ceremonies - stage, film, TV actor & comedian James "GYPSY" Haake, star of the original La Cage Aux Folles nightclub in Beverly Hills. Now 85 years old, GYPSY is 2015's Guinness Book of World Records' Oldest Working Female Impersonator, a Palm Springs Walk of Stars inductee, and one of the funniest men alive. Recently featured in Miley Cyrus' YOUNGER NOW music video as well as performed with Miley Cyrus at the 2017 MTV Video Music Awards (VMAs). You never know who might appear! From Marilyn Monroe, Dolly Parton, Reba McEntire, P!nk, Lady Gaga and Katy Perry, to Liza Minnelli, Judy Garland, Dionne Warwick, Bette Midler, Joan Rivers, Barbra Streisand and more...its always a star-studded evening! All celebrities are portrayed by professional male actors - you will not believe your eyes!